Church Island is a non-denominational chapel located on Chocorua Island, Squam Lake, in the town of Holderness, NH. A beautiful and peaceful place for worship and meditation. All are welcome to join worship services on Sunday mornings throughout the Summer. Services held June to September. During inclement weather, services are held alternatively at the Playhouse of the Rockywold-Deephaven Camps. If questionable, location of that morning’s service will be posted below by 8:30 a.m. the morning of the service. 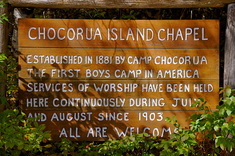 Chocorua Island is the site of America’s first resident boys’ summer camp. Established in 1881 by Mr. Ernest Balch, it operated until 1889. Religious services were a vital part of the camp’s activity. In 1903 a group of Mr. Balch’s relatives and former campers organized the Chocorua Chapel Association “for the purpose of religious services according to the form of the Protestant Episcopal Church.” Mr. Clinton Crane, the owner of the Island, made it available for worship services and in 1928 he generously donated it to the Association for that sole purpose. For 38 years, Dr. Clifford Twombly, one of the founders of the Association, conducted services. Since 1941, they have been led by clergy of various denominations, many being summer residents of the Squam area. A list of preachers and pictures of the original boys’ summer camp are in the Memorial Book near the entrance to the chapel. Chocorua Island Chapel is honored to have been nominated and approved to be in the National Register of Historic Places as of October, 2016. The Chapel Association permits the quiet, limited use of Chocorua Island by visitors willing to respect it as a religious sanctuary. Parties or alcoholic beverages are not allowed at any time. The Island docks are closed between sunset and sunrise. The summer of 2019 marks the 116th year of the Chocorua Chapel Association. The number of people dedicated to its care and operation has grown and the desire for natural simplicity has endured. Necessary island upkeep is ongoing and will remain a priority for the Association. Gifts to Chocorua Island Chapel Association in support of Church Island are appreciated. We trust that our Chapel will outlive us all!